There are many websites available to teachers planning to teach the Holocaust. An excellent place to begin is the Teacher Education section of the United States Holocaust Memorial Museum, which offers guidelines for teaching about the Holocaust, topics to teach, and links to additional resources by topic. The teaching of history is best accomplished when it is grounded in historical documents and sources. 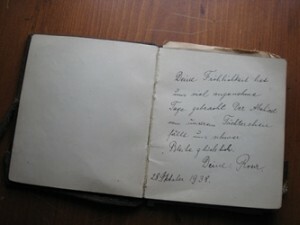 Today there is a wealth of Holocaust documentation available, thanks to the opening of archives from around the world. Using historical documents both grounds the teaching of the Holocaust in its time and place, and serves as a refutation to Holocaust denial. 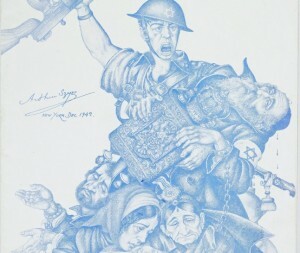 The largest collections of documents, photographs, and testimony reside at the United States Holocaust Memorial Museum (www.ushmm.org) and at Yad Vashem (http://www.yadvashem.org/). Before the Holocaust: Concentration Camps in Nazi Germany, 1933-1939 — Site from the Birkbeck School, University of London which provides documents and recordings from Nazi leaders that show how preparation for and life in concentration camps. German Propaganda Archive — From Calvin.edu, this site offers documents and visual material that opens a window on how the Nazis crafted their message against Jews and other undesireables. Ghetto Encyclopedia (Hebrew only) – Yad Vashem’s extensive online encyclopedia of European ghettos. Hannah Arendt, “A Reporter at Large: Eichmann in Jerusalem.” The New Yorker. (February 16, 1963). The original article published by Arendt from her experience viewing the trial of Adolf Eichmann in Jerusalem in 1960-61. Holocaust Rescue and Relief: Digitized Records of the Unitarian Universalist Service Committee – Andover-Harvard Theological Library is the official archive for the Unitarian Universalist Service Committee’s records, documenting the work of the Committee from 1939 to 1967. The records scanned included 238,000 documents and 3,100 photographs. Searching requires patience, but some excellent items can be used with students, including letters about displaced persons from the Child and Youth Projects. The Holocaust Resource Center, Yad Vashem – This is the portal through which one may locate the extensive collection of resources at Yad Vashem. These include: historical documents; diaries and letters; testimonies and more. The Lodz Ghetto (photographs of Henryk Ross) — Website devoted to the 4,000 photos housed at the Art Gallery of Ontario. Site includes special section for Teachers and Students. In the Matter of Josef Mengele: A Report to the Attorney General of the United States — 1992 report from the Office of Special Investigations, Department of Justice, on the whereabouts of Josef Mengele from the time of the end of the war. Very large document. The National Archives and Records Administration: Holocaust-Era Assets – This portal opens access to legislation, research, and other resources on the issue of stolen property. 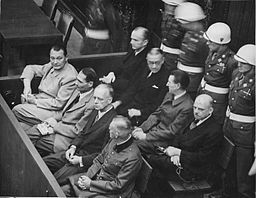 The Nuremberg Trial Collection , The Avalon Project, Yale Law School – This page provides links to dozens of documents produced as part of the trials of Nazi war criminals at Nuremberg. Nuremberg Trials Project, Harvard Law School Library – This portal provides historical background, documents, photographs, and links to other sites on the Nuremberg trials. Old Magazine Articles — This website has three categories of historical periodicals and articles that cover the period of the Holocaust: Jews in the 20th c.; the Nazis; and World War II. Our Shared Legacy: World War II and the “Joint” – Search the archives of the Joint Distribution Committee for photographs and names of people helped during the Holocaust. 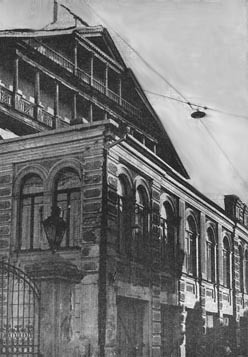 Refuge in Shanghai – The Joint Distribution Committee draws from its archive to provide documentation about the 17,000 Central European Jews who found refuge from the Nazis in Shanghai, China. 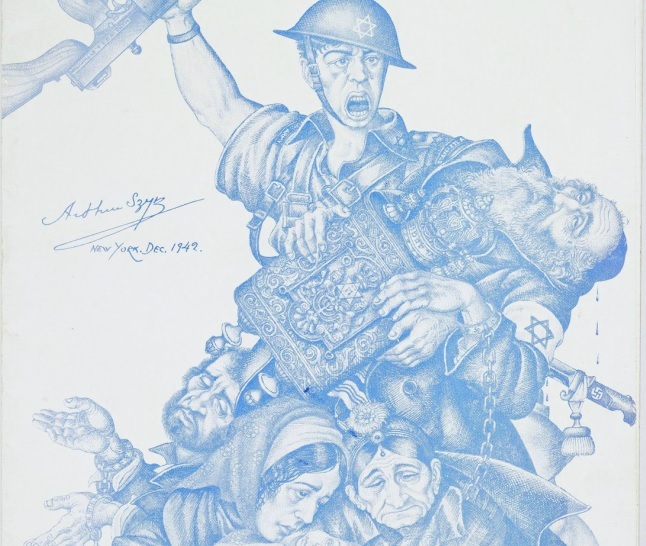 Special J-Vault for Yom HaShoah, at the Berman Jewish Policy Archive (NYU) – The BJPA provides access to a vast collection of journals produced by Jewish communal organizations from 1900 to today. This special collection provides links to articles from the late 1930s, giving a window into the thinking of the American Jewish community at the start of the Holocaust. The Story of the St. Louis – The Joint Distribution Committee draws from its archive to provide letters, telegrams and official statements about the S.S. St. Louis and its passengers. The Universal Declaration of Human Rights – The UDHR was taken up by the United Nations General Assembly in 1947 and adopted in 1948, a direct result of the Holocaust. This site provides the full text of the declaration, historical background, and other resources. Addressing Anti-Semitism: Why and How? A Guide for Educators (Yad Vashem and Organization for Security and Cooperation in Europe) – This more than 30 page document includes educational goals and outcomes and good practice for educators addressing antisemitism in their classes. Bringing Art into Holocaust Instruction — Blog post on Facing History and Ourselves with links to other resources. Considerations and Guidelines for the Use of Visual History Testimony in Education (USC Shoah Foundation Institute) – Suggestions on how to incorporate video testimony into classroom lessons on the Holocaust from the Shoah Foundation, which has one of the largest collections of visual survivor testimony. Deathly Silence Workshop, The Southern Institute for Education and Research – Teacher Guide and Workbook explores the role of bystanders in the Holocaust. Extensive teacher resource guide, especially in the area of the role of America during the war. Educational Resources: Art and the Holocaust — from the University of Minnesota Center for Holocaust and Genocide Studies, includes links to lesson plans. Educational Resources for Holocaust Remembrance Day – Page of links in multiple languages updated regularly by Jacob Richman. History Unfolded: U.S. Newspapers and the Holocaust — This project from the US Holocaust Memorial Museum invites viewers to locate articles in their hometown papers that document the Holocaust. The Teacher Resources Page offers lesson plans and ideas for using History Unfolded in the classroom. The Holocaust: A Teaching Guide for Catholic Schools – Developed by Dan Napolitano, the late Director of Education at the US Holocaust Memorial Museum and presented to Pope John Paul II. The Holocaust Chronicle: Encyclopedia of the Holocaust – Online version of the book by the same name. Serves as an encyclopedia arranged by date with brief but clear overview of the events of that date. Good for research projects. 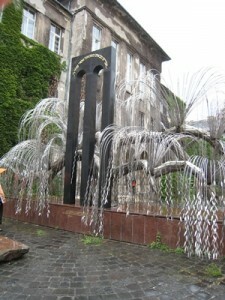 Holocaust Commemoration in European Countries – While the display is a bit dated, the information is very useful. Identifies the date of commemoration of the Holocaust in European countries with an explanation of that date’s significance. Holocaust Denial on Trial — This excellent site at Emory University emerged from Prof. Deborah Lipstadt’s legal battle with denier David Irving. The site offers a history of Holocaust denial, ways to refute deniers, the background of the Lipstadt v. Irving trial and other important information. Holocaust Education and Archive Research Team (HEART) – Extensive research site developed by a group of “independent researchers.” Provides good support to major institutions such as the Holocaust Museum and Yad Vashem. Holocaust Memorial Days in the OSCE Region: An Overview of Good Governmental Practices – Nice companion to visual display Holocaust Commemorations in European Countries, this document explains official government practice in each European country to commemorate the Holocaust. The Holocaust Teacher Resource Center – Excellent up to date website devoted to teaching about the Holocaust. Some might find helpful the link to lesson plans available for purchase. Information Portal to European Sites of Remembrance— Click on the map of Europe and which opens up a page of links for each country. Follow the links to see how sites of destruction have become memorials. Jan Karski: Humanity’s Hero — Google Cultural Institute virtual exhibition on the Catholic Polish diplomat who tried to alert the Allied powers to the destruction of European Jewry. See also the Jan Karski Educational Foundation for films, materials and lesson plans. The Jewish Foundation for the Righteous – Fascinating site dedicated to the non-Jews who saved Jews during the Holocaust. Search by country to read stories. The site also provides videos of reunions between survivors and their rescuers, and “Ask a Rescuer” where you can read questions and answers from previous conversations with students. Jewish Partisan Educational Foundation – Site dedicated to education about those who resisted the Nazis and their collaborators. Offers online classes for teachers, online films, curriculum materials, and more. Learning About the Holocaust Through Art: ORT and Beit Lohamei Haghetaot – Website devoted to using the work of artists in the ghettos and camps to teach about the Holocaust. Includes teachers’ guide and student learning materials. Learning from History — This is an educational portal maintained by the Association for Remembrance, Responsibility and Future which is linked to the Berlin Technical University’s Institute for Social Science, History and Citizenship Education. The site offers videos of conferences and lectures on topics such as “Antisemitism and the Power of Cartoons,” as well as pedagogic resources for teaching the Holocaust. Museum Fellowship (USHMM) Teaching Resources – Page of lesson plans and book reviews created by teacher fellows at the United States Holocaust Memorial Museum. The Museum of Jewish Heritage, A Living Memorial to the Holocaust- For Teachers – This museum based in New York offers excellent workshops for teachers, as well as curriculum materials that can be downloaded and/or ordered through their website. Nazi Germany and the Jews, 1933-1935 — Abridged edition of book by Saul Friedlander, fully available online as PDF. Shoah in the News: Patterns and Meanings of News Coverage of the Holocaust — Analysis by James Carroll, author of Constantine’s Sword, of how the press ignored the Holocaust when it happened and the topic was so widely covered in the 1990s. A Teacher’s Guide to the Holocaust, The Florida Center for Instructional Technology – Nicely organized site with a variety of materials including: plays; music; maps and more. Teaching the Holocaust with Online Art: A Case Study of High School Students — Article in the Journal of Social Studies Research, available through the ERIC database. Teaching Resources: The Holocaust (at The New York Times) – Offers links to lesson plans, archival articles from The New York Times, and discussion group on how teachers plan to use the materials. 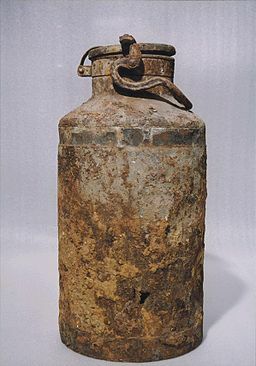 Time Capsule in a Milk Can: Emanuel Ringelblum and the Secret Archives of the Warsaw Ghetto – Teachers’ Guide provides timeline, background, classroom activities, and links to find further information. Appropriate for grades 6 and up. Dates from 2003. Why Teach about the Holocaust? – Downloadable document from UNESCO: United Nations’ Educational, Scientific, Cultural Org. 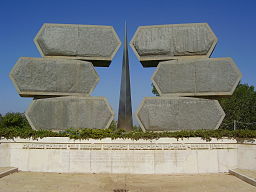 Yad Vashem: The International School for Holocaust Studies Educational Materials – Page offers lesson plans, guide to developing memorial ceremonies, educational resources, and links to films, interviews and other materials at Yad Vashem’s extensive database of resources. The 50th Anniversary of the Eichmann Trial, Yad Vashem – Special online exhibition devoted to the trial of Adolf Eichmann. Includes information about his role in the Holocaust, the secret quest to capture him in Argentina, his trial, and its significance. America and the Holocaust, PBS “American Experience” – YouTube documentary shown on “The American Experience” about letters exchanged between Kurt Klein, his parents, and government officials in their desperate attempt to leave Europe. The Auschwitz Album, Yad Vashem – One of a pair of photo albums that survive to bear witness to the experience at Auschwitz. This album documents the arrival and processing of Hungarian Jews at Auschwitz in the summer of 1944. The Auschwitz Album: Documentary – This video tells the story of the other Auschwitz album, which is in the collection of the US Holocaust Memorial Museum. This album was the property of Auschwitz camp adjutant commander Karl Höcker, and its photographs were taken at approximately the same time as the album in the Yad Vashem collection. This album shows Nazi soldiers and their female companions working as well as enjoying summertime just yards from the killing center. Auschwitz: Inside the Nazi State, PBS – Companion website to television program. Includes: interactive map of the subcamps of Auschwitz; timeline; teaching guides; and interviews with scholars and historians. Before They Perished: Deportation of Jews from Zaglebie Dabrowskie to Auschwitz, from the Auschwitz-Birkenau State Museum. Box of photographs found in the ruins of Birkenau after liberation, these images show the world of Polish Jews before the Holocaust. Note especially the contrast in clothing, showing the evolving religious culture as Polish Jewish society changed in the inter-war period. Brundibar: Children’s Opera at Terezin, PBS “Now With Bill Moyers” – From 2004, this site still provides an overview with links to the story of the production of the children’s opera at Terezin, the “model” concentration camp. Centropa – 42 films include documentaries and stories of European Holocaust survivors telling about their lives before, during and after the Holocaust. Most films are between 10 and 20 min. long. Children of the Lodz Ghetto — Interactive research project at US Holocaust Museum. Visitors participate in identifying the experience of young people living in the Lodz Ghetto by using databases and scanned records to piece together their stories. The Children of Nazi Leaders – “60 Minutes” episode (15:58), aired originally 1991. Interviews children and relatives of senior Nazis about what life is like bearing the stigma of their family members’ sins. The Defiant Requiem Foundation’s Holocaust Education Resources – The Defiant Requiem was a production at Terezin of Verdi’s Requiem by Jews and other incarcerated prisoners. The production is viewed as an act of defiance against the Nazis. This website offers teachers’ guides to how to incorporate the story and opera into classes on the Holocaust. Efootage — collection of historic films on the events of modern Jewish History. See films such as the dramatic images of “Holocaust Survivors Entering the US” among many others. Ephemeral Films Project: National Socialism in Austria — A project of the US Holocaust Memorial Museum, the Austrian Film Museum and the Ludwig Boltzmann Institute. This site is a collection of 50 films, mostly home movies and other amateur films, which show Austrian life and Jewish life before and after the annexation (Anschluβ) of Austria in 1938. Viewers can locate films where they were shot on a map, identify films that show key individuals, search for organizations identified in the films, locate films by event (in German) or browse the list. Genocide under the Nazis Interactive Timeline, BBC History Site – Click on any date to see how the Nazi war against the Jews developed from the time of Hitler’s election in 1933. Hatikva at Bergen-Belsen – Recorded May 20, 1945, Jewish survivors of Bergen-Belsen five days after liberation sing “Hatikva” at the first Sabbath service conducted openly on German soil after the start of the Holocaust. Hitler’s Children – Film by Israeli filmmaker Chanoch Ze’evi, includes interviews with children, grandchildren and other relations to high ranking Nazis. Centerpiece of the film is Ze’evi’s trip to Auschwitz with the grandson of Rudolf Hoess, commandant of Auschwitz. Website includes the film’s trailer. History is Happening: Origins of World War II – YouTube channel showing episodes of a series previously shown on British television. There are some particularly useful episodes about Germany during the Nazi rise to power, as well as the political background behind the invasion of Poland and other countries. Into the Arms of Strangers – Companion website to the documentary about the Kindertransport to England. Website includes study guide, excerpts from interviews with former “kinder,” and historical background. Jewish Partisan Educational Foundation – Films about Jewish partisans and their activities. Includes: Introduction; Women in the Partisans; Living and Surviving in the Partisans; and more. Film lengths between 3 and 24 minutes. Kristallnacht: The November 1938 Pogroms – Special exhibit at the US Holocaust Memorial Museum, includes: video testimony; photographs; and links to articles. The Map as History: The Final Solution – Narrated map illustrating the development of the Final Solution from the invasion of Poland in 1939 through 1945. Memory of the Camps — From PBS “Frontline,” footage from April 1945 film of the death camps, filmed by US and British army crews and directed in part by Alfred Hitchcock. The program contains very graphic images and should be used with extreme caution with students. The website offers a teachers’ guide with film notes and discussion prompts. Music and the Holocaust – This website offers a rich collection of audio links to music composed during the Holocaust in camps and ghettos, as well as articles for historical background. Music of the Holocaust, exhibit at the US Holocaust Memorial Museum – This exhibit draws on the collection of audio files and articles in the Museum’s collection to create an interesting and useful exhibit on music created in camps, ghettos, in hiding, and after the war. “Nazi Concentration Camps (1945)” Original footage filmed by George Stevens under the direction of General Dwight D. Eisenhower. This is extremely graphic footage of what the United States liberating forces found when they entered camps in Europe. This should only be used with extreme caution in high school classrooms. Nuremberg, The Robert H. Jackson Center — Site devoted to the biography and legal opinions of Jackson who was US Supreme Court Justice as well as Chief Prosecutor at Nuremberg. The website offers a video library documenting the Nuremberg trials day by day as well as a month by month annotated timeline of the trials and Jackson’s role as chief prosecutor. 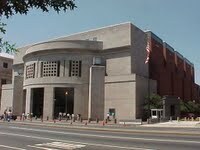 The Path to Genocide – Film at the US Holocaust Memorial Museum. This 38-minute film is divided into 4 chapters, which allows the teacher to stop after each segment for explanation and discussion. For those who are unable to live-stream video, the link provides a request form for ordering a DVD of the film. Propaganda — Online exhibition at the United States Holocaust Memorial Museum. This exhibit offers a definition of propaganda, interactive timeline, artifacts gallery and lessons for the classroom. Click on Themes and follow the pages to find interactive experiences that ask the viewer to explore how propaganda works. Radio News – Follow Radio Events to “The Austrian Crisis” and “The Munich Crisis.” Hyperlinks within the articles connect to radio broadcasts from 1938.
reVilna: Exploring the Vilnius Ghetto – Interactive map that traces the Vilna Ghetto from its construction to its liquidation using images, testimony and timeline. Topics include: Formation of the ghetto; Aktionen; Judenrat; health and education; life in the ghetto; art and culture; resistance; and end of the ghetto. Some Were Neighbors: Collaboration & Complicity in the Holocaust – Online interactive exhibition parallels the new exhibit at the US Holocaust Museum. Viewers explore the roles of teachers, police, workers, neighbors, teenagers, religious leaders, and friends in aiding Nazi plans to eradicate the Jews. Site includes special teachers area with lesson plans and resources. Sound Map: Jewish Survivors of the Holocaust, British Library – Audio recordings of Holocaust survivor, searchable by country as indicated on a map of Europe. Steven Spielberg Jewish Film Archive Virtual Cinema – Online library of over 10,000 films and videos. Search by topic including: Jewish communities; Holocaust and WWII; Pre-State Israel; and State of Israel. They Spoke Out: American Voices Against the Holocaust – Produced by Disney and the David S. Wyman Institute for Holocaust Studies, this website uses animation to tell the stories of the S.S. St. Louis, the attempt by Anne Frank’s family to immigrate to America, Varian Fry’s rescue of European Jews, and more. 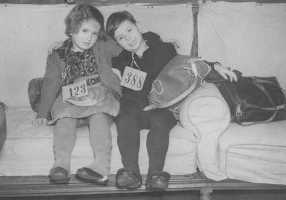 They were Children: Deportation and Rescue of Jewish Children in Paris 1940-1945, exhibit of images and text about Parisian Jewish children after the Vel D’Hiv round up. Voyage of the St. Louis , US Holocaust Memorial Museum – This interactive website takes visitors on a journey of discovery. Using archival records in the Museum’s collection, visitors try to discover what happened to four passengers on the S.S. St. Louis when it was turned back to Europe in 1939. World News Videos: Hitler Takes Austria – This is just an example of what is available on this website, with its extensive collection of videos about WWII. The International Status of Education About the Holocaust — UNESCO report on textbooks and curricula for teaching the Holocaust around the world. Today there are many training opportunities for teachers who want to feel prepared and competent to teach about the Holocaust. But how many of us feel knowledgeable about post-Holocaust issues? Issues include the ongoing quest by families to be compensated for lost property, bank accounts, and insurance policies, as well as the payment of those forced to perform slave labor for German companies. 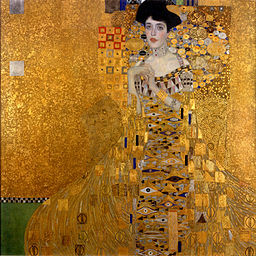 Perhaps the most prominent issue today is the quest to regain valuable artwork stolen by the Nazis and placed in European museums after war. Is this an important topic to teach? The Central Registry for Information on Looted Cultural Property 1933-1945 – Search by country, object, register family losses, and read the latest news on stolen property. Cultural Plunder in France – Provides historical overview of the confiscation of Jewish property by Alfred Rosenberg and his henchmen, as part of a plan to create a museum of the lost Jewish race. European Shoah Legacy Institute — This is an internationally-supported organization created by the Terezin Declaration of 2009. It promotes restitution and compensation for Holocaust victims, as well as other activities dealing with the legacy of the Holocaust. 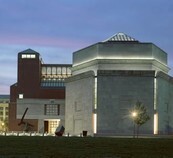 Holocaust Restitution and Reparations, Jewish Virtual Library – This portal connects to sites on filing claims, stolen art, and background information. The site has not been updated recently. Readers’ Guide: Shoah Survivors — This Guide from the Berman Jewish Policy Archive includes statistics on where survivors live, their rate of poverty and aging, health issues, among other topics. It also provides links to journal articles on the topics Demography; Generations and Memory; Health and Other Needs; and Restitution. The articles date from 2011 to 1946. Resolution 766 – Issued by the US House of Representatives on compensation for property seized during the Nazi and Communist Eras (August 2, 2012). Centropa – Extensive database of interviews, photographs and videos of Holocaust survivors from 15 European countries. Coming of Age Now in the Holocaust, Museum of Jewish Heritage – Testimonies of children and teens, written and video formats. Registration is suggested but not required. Database of Greek-Jewish Holocaust Survivors’ Testimonies – More than 1500 visual and oral testimonies of Greek Jews who survived the Holocaust. Includes historical overview of the Jews of Greece and map of routes that survivors took. Fortunoff Video Archive for Holocaust Testimonies, Yale University – A collection of more than 4,000 videotaped testimonies. See also the film made from their testimonies which aired previously on PBS and is now available on YouTube. The Holocaust Collection, National Archives and United States Holocaust Memorial Museum – This terrific website is organized around four themes: Stories from the US Holocaust Memorial Museum; Concentration Camps; Looted Valuables; and National Archive Records. Each theme offers rich detail as it draws from the extensive resources of the Archive and Museum collections. Well organized and very easy to navigate. Jewish Veterans of WWII, Library of Congress – Audio, video and correspondence from Jews who served in the US military in the European theater. Segments for the Classroom (USC Shoah Foundation Institute) – Seven downloadable segments containing testimony on the themes: The Holocaust Through the Eyes of Child Survivors; Facing Persecutions as Jehovah’s Witnesses; The Warsaw Ghetto Uprising; Surviving Auschwitz II-Birkenau; The Auschwitz II-Birkenau Sonderkommando; and the Sobibor Uprising. Surviving Auschwitz: Five Personal Journeys (USC Shoah Foundation Institute) – Interactive tool that allows viewer to follow five survivors on their journeys from their homes to incarceration in Auschwitz, and eventually to freedom. Along the way view video testimony about each part of the journey. 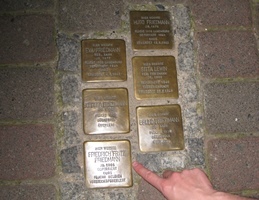 Survivor Testimonies (at the United States Holocaust Memorial Museum) – This section of the Museum’s web resources includes: video testimonies; essays; writings by survivor volunteers at the Museum; diaries; and a link to an online exhibition with testimonies about life after the Holocaust. Teaching History Matters – View About/Start. This blog tells the story of teacher Matthew Rozell in Hudson Falls, NY, under whose guidance his class’ research brought about the reunion of survivors and their liberators. Telling their Stories, Oral History Archives Project of The Urban School of San Francisco – Interviews with Holocaust survivors conducted by high school students in San Francisco. Includes a “micro-documentary” weaving together excerpts of the interviews. Voice/Vision Holocaust Survivor Oral History Archive, University of Michigan – Archive of interviews with survivors, educators’ materials, and links to online resources. Voices of the Holocaust, British Library – Testimonies of British Holocaust survivors, resources include maps, classroom activities, and other teaching ideas. Voices of the Holocaust, Illinois Institute of Technology – Unusual site that houses digitized recordings made in 1946 by David Boder, psychology professor at Illinois Institute of Technology. Boder travelled to refugee camps and recorded survivors in their own words. Yad Vashem Holocaust Martyrs’ and Heroes’ Remembrance Authority, Remembrance –This page search for survivor testimony, names of victims in the Shoah Victims’ Names Database, and view special exhibits in Here Their Stories Will Be Told. This guide to the resources of the US Holocaust Memorial Museum streamlines the Museum site’s navigation, linking pages to the curriculum guide set forth by the Museum. The guide also provides links to off-site resources for teaching Jewish life before the Shoah. See the new film produced by the Museum: The Path to Nazi Genocide. This 38-minute film is divided into 4 chapters, which allows the teacher to stop after each segment for explanation and discussion. For those who are unable to live stream video, the link provides a request form for ordering a DVD of the film.